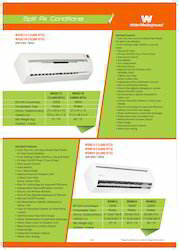 Avail from us a wide range of White Westinghouse Air Conditioners. Featuring Advance Tech Series Split Air Conditioners, these ensure high functionality and are very energy efficient. Available in different models, we invite queries from our buyers and ensure to deliver the product to our clients within stipulated time frame at best available prices in the industry. Looking for White Westinghouse Air Conditioner ?